Disk Brushes are round brushes that are fairly flat. The filaments can either point away from the center or toward the center of the brush. Outside Disk brushes have the filaments pointing away from the brush center. These are straight brushes that have been formed into cylinder shaped brushes with one loop of the wound brush cut off and pressed flat. The size of the metal channel will determine the thickness of the brush at the metal base, but the filaments may or may not flair out depending on the length of the filament and the type of filament that has been chosen. Outside Disk brushes have a split in the hub and should not be used for applications that require rotation. Since they are made from Metal Channel Cylinder brushes, there is a lot of flexibility in available sizes. 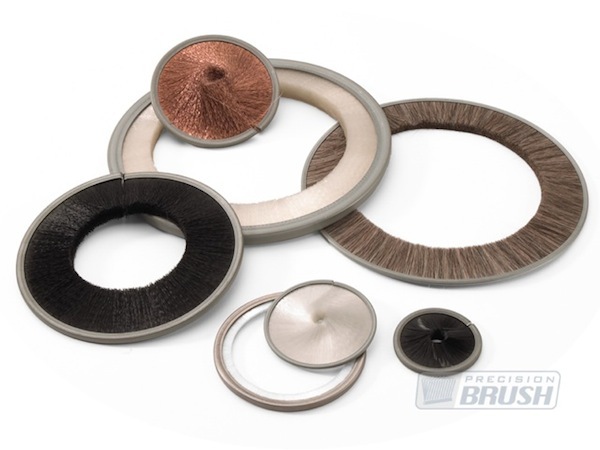 Custom diameters are easier to manufacture and do not require as much tooling as other styles of disk brushes. Copper Center Wheel brushes are also disk shaped brushes. Sizes are limited, but these are a good choice where higher speed brushing is required. 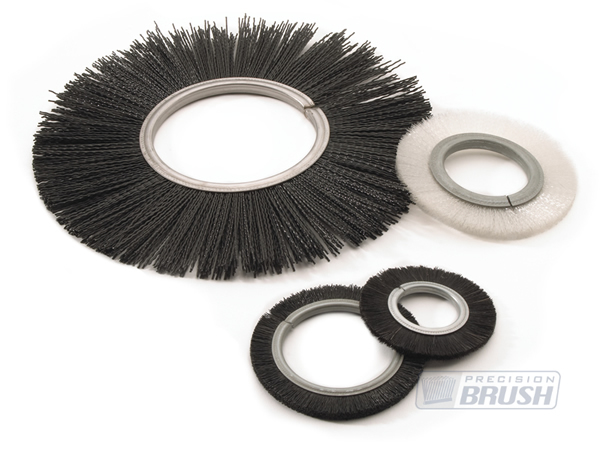 Wheel brushes can be used in drills and air tools for traditional brushing applications. Inside Disk brushes, or Internal Ring brushes are disk shaped as well, but the filaments point inward from the outer metal ring. In order to manufacture these, straight strips brushes are formed in our custom made machine into a wound cylinder shape. One loop is then cut from the cylinder and flattened. The size range and flexibility in filament choices are almost endless and result in ideal brushing or sealing for lead screws, holding products in place or wiping and cleaning anything that goes through the brush.